Allegheny Equine Veterinary Service is a full-service equine and large animal veterinary practice based in Elkins, West Virginia. The practice was established in the Fall of 2005 by Dr. Tracy Walker. For ten years the practice has operated exclusively as an ambulatory medical service to Randolph, Barbour, Tucker, Upshur, Preston and Pocahontas Counties in the mountains of West Virginia. Since opening, the practice has offered advanced diagnostics and services that were previously unavailable in the area. 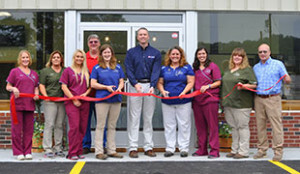 In recent years, it became apparent that a haul-in facility was needed and would provide even more opportunities for availability of equine and large animal veterinary care. In May 2015, we opened a 5,000 square foot hospital in Elkins, West Virginia. The practice continues to offer ambulatory care with the addition of enhanced care in a hospital setting. We are proud to offer state-of-the-art medicine, diagnostics, and treatment on-farm or in our new hospital. We pride ourselves on exemplary client service and compassionate patient care. We are honored that you have chosen our practice! It is our goal to provide excellent veterinary care to every patient with compassion, dedication, and personalized service. We are committed to practicing evidence-based medicine and educating our clients on the latest advancements in our field to help our patients live long healthy lives.